US orders: With your donation of $15, we will send you this fine poster of a magnificent Mangalarga Marchador suitable for framing! Shipping and handling is $5 so the total charged is $20 for one poster. You can order 3 posters for $50. International orders: With your donation of $15, we will send you this fine poster of a magnificent Mangalarga Marchador suitable for framing! Shipping and handling is calculated by country. The funds collected will be allocated to a fund for Marchador Horses in need. Because this is a fund-raiser, you can also contribute more. Limited quanties available! 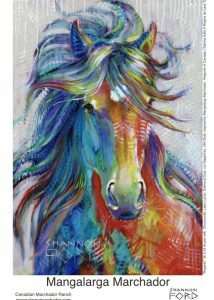 The poster is on high gloss paper and is a copy of an original painting by Shannon Ford. The horse depicted is her young stallion Canadian Regente in vibrant colors. For any art or Marchador afficiando, this is a great piece to decorate your walls! Measures 12 x 18. You can order yours today using the Paypal button below or send a check to Lynn Kelley, 10487 E Rising Sun Dr, Scottsdale, AZ 85262 who is distributing the posters.